We all use filters. Yes, even those people who we’d say don’t have filters…the people who seem to have a direct link from their minds to their mouths. Others, who rarely share their opinions, might say they have the “proper” filter, only speaking when it’s absolutely essential. Perhaps you filter things through your experiences, counseling perspective, education, culture, and the list goes on. It’s important to know your filters, because if your filters are faulty, or even if the priorities of your filters are out of order, what you end up with at the end of the trail of filters won’t be as pure as you trust it to be. For example, perhaps you’ve learned some great tools through counseling. When a problem arises, you return to those tools and the things you’ve learned and filter the problem through them. If the straining process resolves the issue, that’s all you need. You consider the solution a success. Or, perhaps an issue comes up, and you can tie it to your education. You can chart the flow of information or organization because of what you’ve been taught, so as you strain the issue through your education, it all pretty much falls into place and makes sense. You can explain it, so from your perspective, the issue is resolved. Maybe you find yourself in a situation that reminds you of a past experience. You remember what worked and what didn’t, so you determine how to respond based on what makes sense from past experiences, good and bad. Learning from counseling, education, and experiences is important, even essential, to moving forward in life at times. Yet if they’re your primary filters, you’re missing out on something. Until our primary filters are God’s Word, we’re going to let some things through that aren’t His truth, and we might filter some things out that are. God’s Word has to be the first filter, not the last resort. We can’t run to it as a self-help book when we’ve exhausted all our other resources. 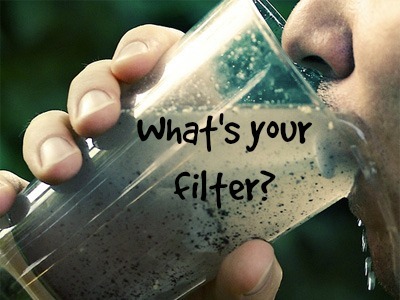 It’s the top filter, where we initially pour our problems, issues, relationships, and questions. All other filters are secondary. Know your filters. Don’t just assume because you are a Christian, you stand firmly on God’s Word in all situations and relationships. You might say you fully trust God, but do you, really? Are you letting Him consume every single moment of your life, every decision you make? Do you run to Him before anything and everyone else, then trust Him to guide you to the right resources and people He’s placed in your life? If you trust Him, really trust Him. And if you don’t, you can start right now, today, by asking Him to begin filtering every aspect of your life. You can depend on Him. Posted on April 13, 2015 March 24, 2015 by SusanHLawrencePosted in My Life with GodTagged assumptions, Christians, filters, tests, thoughts, training, trust.